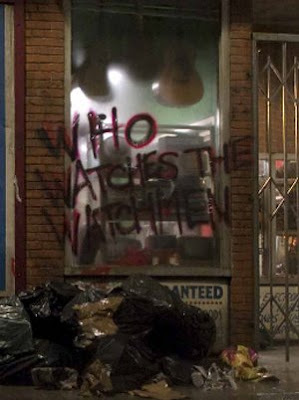 There has been a lot of hype about The Watchmen- Legal problems and controversy that caused the release date to be moved back repeatedly, seemingly endless publicity, posters and trailers that popped up everywhere. Just the kind of thing that makes me not want to see a movie. Overkill. I haven't read the graphic novel, though I'd like to, so I really had no reason to want to see this movie. But I did, and I'm glad. It was awesome. I'm not sure why it has received such bad press and mixed reviews. It was beautifully shot and well written, the music was great and the special effects super cool. It was really just a great movie. I don't want to say too much about it, because I think a lot of people haven't seen it yet. If you haven't seen it, you should. I'd hate all the hype to make The Watchmen do worse in the theater than Paul Blart: Mall Cop. Then we'll really be f*&ked.